相聚大明星 共度母親節 Please save your day on Mother's day! Hai Yan Jackson Chinese Dance, Stanford U Chinese Dance , and CFDA present a Chinese community collaborative dance performance "Dancing Colors Of Spring" in the heart of SF Chinatown. 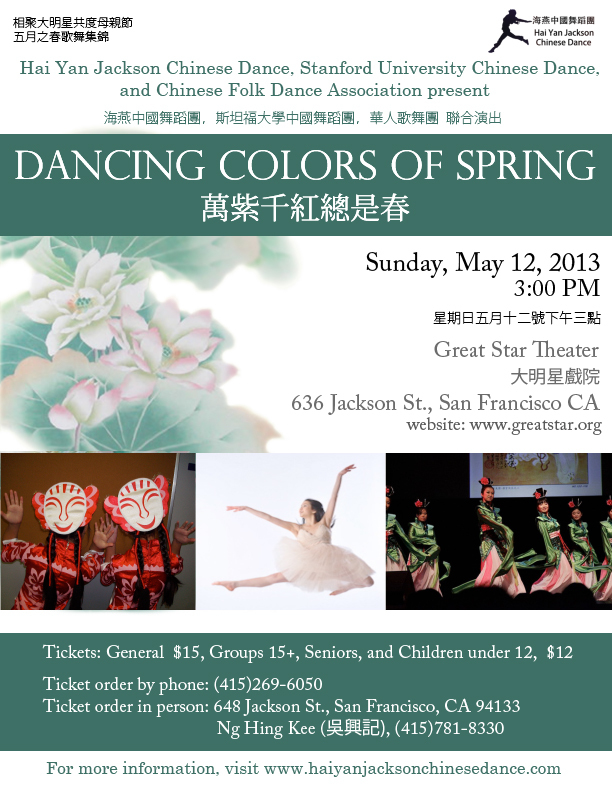 In May 2011 Hai Yan Jackson Chinese Dance and Stanford Chinese Dance and Chinese Dance Association together launched Dancing Colors Of Spring at Jewish Community Center and May 2012 at Herbst Theatre. We had proudly and successfully presented two ethnic dance performances in San Francisco. We would like to thank our community for supporting Chinese Culture through ethnic dances and other forms of performing arts. This year we continue our tradition with our annual showcase "Dancing Colors of Spring" performance at the Great Star Theater in the heart of San Francisco Chinatown on Sunday, May 12th, 2013, 3:00PM. Celebrate Mothers' day in a very special way.